This event was held on Sunday, October 7th, from 2:00 to 4:30 pm, at Kin-ken Center. Before starting the contest, an English drama and an English funny short story-telling were performed. 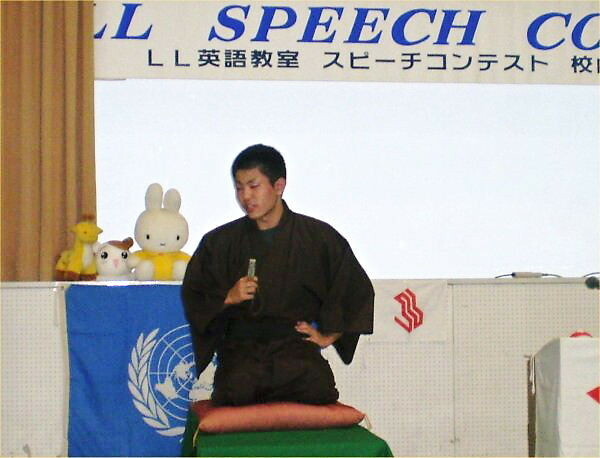 This year’s English Drama: “Belling the Cat”, one of Aesop’s tales had been dramatized by Yoshy and Mr. Yasuhiro Kawamura who is one of the members of Myoko Powerful English Club (M-PEC) composed the effect-sounds. As an English drama has its own clear image, both LL students and M-PEC members can learn “the way of his/her pronunciation” merrily without a doubt. There was full of smiling faces in the audience thanks to “heartwarming carriage of cute cats and mice”. As soon as the drama finished, “music below the stage” which is used when “a rakugo-master” comes in and out was echoed in the hall. 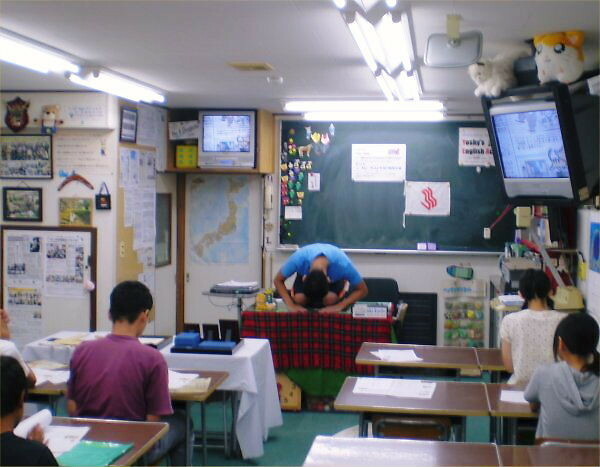 One of the students of LL Shihoya Arai School, Yuichiro Matsuki (AA-class, the 3rd grader of Takada Senior High School) appeared and sat down on a cushion in the music. The roar rose! Y. Matsuki told a short and funny story in rakugo-style. 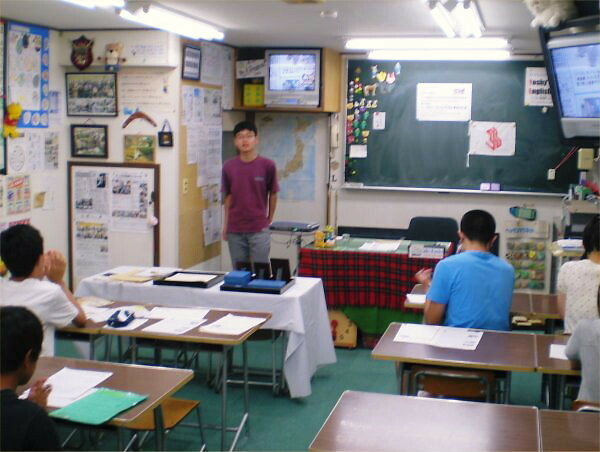 Actually anyone of the member of Myoko Powerful English Club (M-PEC) hasn’t shown yet. 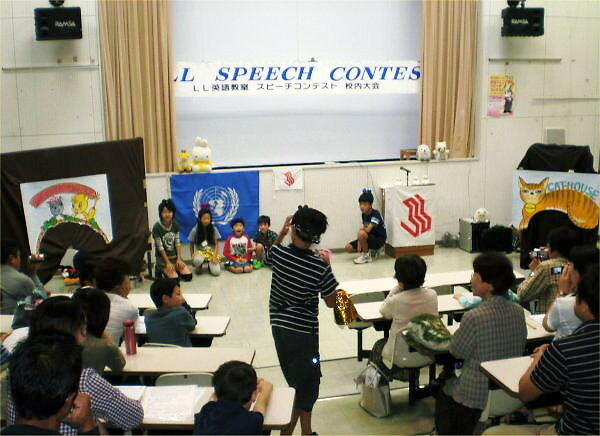 After Yoshy’s greeting, 23 participants from LL elementary school students and under did their best in the speech contest in front of the audience: 80 and over. There were a few good speakers who were telling his/her recitation clearly and vividly this year; Yoshy was sorry for. 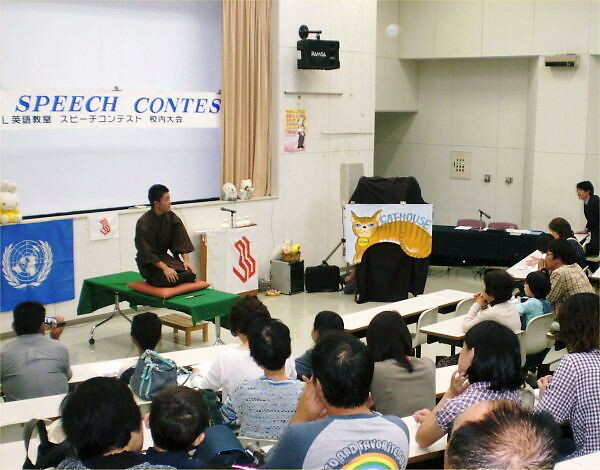 Five contestants to “Niigata Prefectural Contest” were decided. It is going to be held at Ao-re Nagaoka on Sunday, December 9th as follows. Thanks to these participants and their parents, this event was successfully held on Sunday, September 2nd, from 5:00 to 6:30 pm. The delegates who had passed class-preliminary in A44, A3, A1 and AA introduced their speeches they’d been practicing very hard since June. 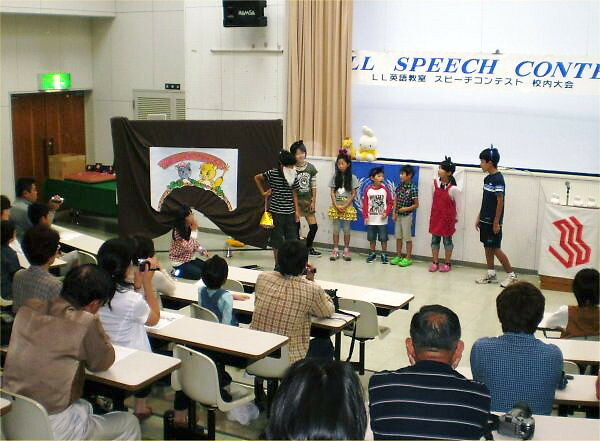 Wataru Yokota (A4 the 1st grader of Arai J/H-S) and Takumi Ushiki (A4 the 1st grader of Arai J/H-S) booked a ticket to “#35 Niigata Prefectural Speech Contest” held at Ao-re Nagaoka on Sunday, December 9th. 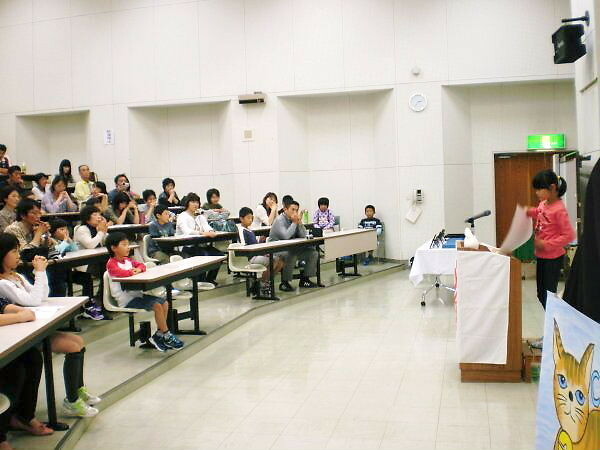 Takako Hirose (A1 the 2nd J/H-S attached to Joetsu University of Education) became a substitute speaker. It’s rather stressful more or less for even Japanese adults to speak what they want to tell even in Japanese, which is common situation, Yoshy bets. “Not to be a tall tree which catches strong wind or “not to be ostracized,”etc …“island-nation mentality has been causing friction against even Asian neighbor countries..
“Learning English” means “learning the power of trying to tell our own wills in a dignified manner when necessary”, which is one of Yoshy’s cherished opinions. Yoshy hopes LL-little children and elementary school ones to follow their senior LL students, these J/S-HS students who is learning Yoshy’s spirit or thought for learning English in LL Shihoya Arai School. Yuichiro Matsuki (AA, the 3rd grader of Takada Senior High School) who are telling a short and funny story, “The Cost of Cigars” in the style of rakugo and won the top-prize. Moreover, he added his original “ochi: a punch line” which was “But you’d better quit smoking; don’t you agree, sir?” – “… Well, you win.” … He could at last make his own vivid atmosphere at the end of this rakugo.